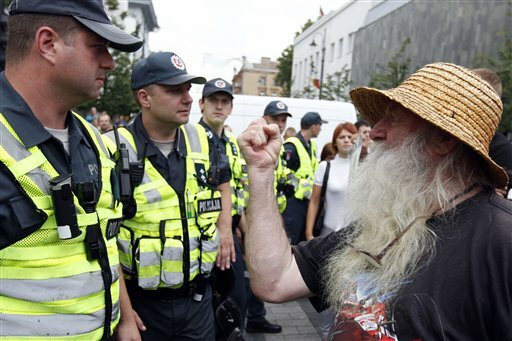 An elderly protester shouts at police protecting a gay pride parade in downtown Vilnius, Lithuania on Saturday. VILNIUS, Lithuania — A group of protesters tried to disrupt Lithuania’s second gay pride parade ever on Saturday, defying an enormous police presence by throwing eggs at marchers and attempting to storm a stage. Lithuanian anti-gay lawmaker Petras Grazulis using a loudspeaker shouts anti-gay slogans during a gay pride parade in Vilnius, Lithuania on Saturday. They were met by hundreds of unruly protesters, 28 of whom were detained, police said. Among them was Petras Grazulis, an anti-gay lawmaker who rallied protesters with a bullhorn. He was thrown face-down on the ground and carried off in handcuffs by police, though the lawmaker soon reappeared at the protest after being released from police custody. About 50 protesters tried to storm a concert stage where activists were to speak, but police forced them off. Protesters also threw eggs, hitting Lithuanian lawmaker Giedre Purvaneckiene and Sweden’s European Union Affairs Minister Birgitta Ohlsson, who were standing at the front of the parade along with other dignitaries. “It shows that we need to march until eggs aren’t thrown anymore and people can march freely and without fear,” said Purvaneckiene, who was not injured. The parade, dubbed “the March for Equality,” is only the second such event for Lithuania, a predominantly Catholic nation of 3 million people that activists say has not done enough to ensure gay, lesbian, and transgender rights. Large segments of the population in Lithuania, along with other areas of the former Soviet Union, are opposed to the idea of equal rights for gay people. In Russia, an unsanctioned gay rights rally in May resulted in clashes, with police detaining some 30 people, while Ukraine held its first-ever gay pride march amid a large police contingent needed to protect the small group of activists. Many feel the unrest in Lithuania, which is currently heading the EU’s rotating presidency, is particularly troubling since the Baltic state, along with neighbors Latvia and Estonia, continues to discriminate against gays and lesbians despite having undergone intense political and economic integration with Western Europe over the past two decades. Authorities in Vilnius initially refused to allocate the busy downtown avenue to the activists but were overruled by a local court. Police said one officer was injured in the day’s event.